A third-place finish at last week's Sony Open shows Canadian Corey Conners belongs on the PGA Tour. Corey Conners was working on his putting last Friday when fellow Canadian Mackenzie Hughes offered some advice. Hughes pointed out that if Conners tucked in his right elbow a little bit, it would improve his setup. 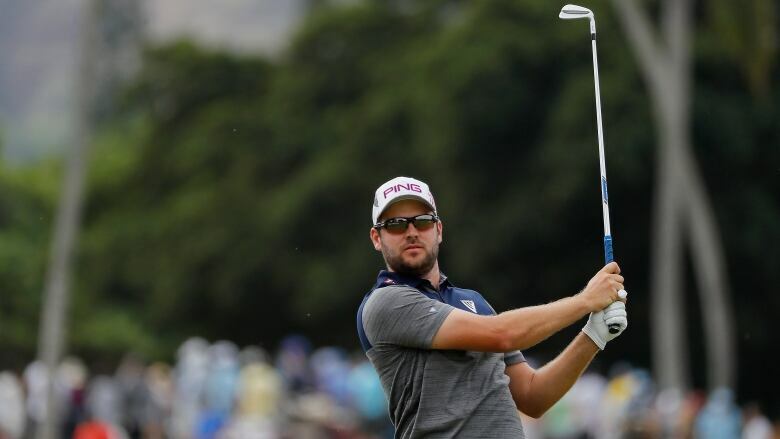 Conners listened to his longtime friend and went on to shoot a 64 in the third and fourth rounds of the Sony Open in Hawaii to finish at 17-under 263 and tie for third after having to qualify for the PGA Tour event at the start of the week. The high finish has helped Conners climb the FedEx Cup standings and given him momentum heading into this week's Desert Classic in La Quinta, Calif.
"It gave me some confidence and I told him on Friday afternoon 'thanks to you, you're going to see my name rocketing up the leaderboard this weekend.' I was able to putt a little bit better and do just that," said the 27-year-old Conners on Wednesday. "He sent me a text after the round on Sunday saying nice work and I thanked him for giving me the tips. I owe him one." Conners, from Listowel, Ont., earned a partial PGA Tour card last season by finishing 130th in the FedEx Cup standings with 353 points. The top 125 players on that list get a full card, with American Harris English earning the final spot with just 50 points more than Conners. But Conners's third-place finish on Sunday, coupled with a second-place finish at the Sanderson Farms Championship and a tie for 23rd at the RSM Classic, has him sitting 19th early in this season's FedEx Cup standings with 331 points. In other words, he's already closing in on his point total from last season and is a virtual lock to earn a full PGA Tour card for 2020. "I was in a position last year where I was trying to fight for my card all through the summer and toward the end of the year," said Conners. "It takes a lot of pressure off. Something that I don't have to worry about as much going forward, I can just focus on having good weeks instead of feeling the pressure to have a certain finish." Given his quick rise up this season's FedEx Cup standings, Conners will likely be asked to play in more invitational tournaments, helping him earn even more points toward next year's card. "It was a bit unknown what events I would get into at the beginning of the year, but having this good start there will be some of the invitational tournaments that I'll be able to get into, which is awesome, and there will be a couple of new events I'll get to add, which is really exciting," said Conners. "It's really helpful to have a good start like I've had to set up the rest of the year." Conners was joined by seven other Canadians as the Desert Classic teed off on Thursday and opened with a 1-under 71. Adam Hadwin of Abbotsford, B.C., opened with a 7-under 65, Adam Svennson of Surrey, B.C., (66) is 6-under, Ben Silverman of Thornhill, Ont., (68) is 4-under, David Hearn of Brantford, Ont., (69) is 3-under, Roger Sloan of Merritt, B.C., and Abbotsford's Nick Taylor (70) are both 2-under while Mike Weir (71) of Brights Grove, Ont., matched Conners in the opening round. Phil Mickelson shot a 12-under 60 for a three-shot lead over Adam Long. 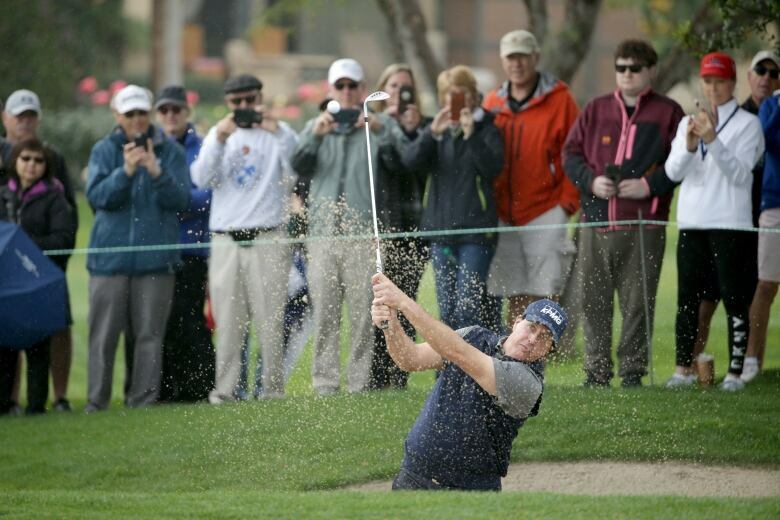 Mickelson tied his career-low score he last shot in the Phoenix Open six years ago. It was the most under par he has been in any of the 2,077 rounds he has played on the PGA Tour. Weir, Hearn, Svensson and Silverman joined Conners on the LaQuinta course. Hadwin, Taylor and Sloan were on the Stadium Course. It's the third time this season eight Canadians are in a PGA event, marking the highest number for a non-domestic tournament since the organization began keeping track in 1970. Despite the name of the Desert Classic, there has been a lot of rainfall in the days leading up to the event. "Hopefully they get some sun the next few days," said Conners. "The golf courses here in the desert are awesome, so lush. The grass is perfect. They're beautiful courses. "The greens are rolling really nice so I'm real excited to get going. I like the golf courses a lot. It's hard not to enjoy when yourself when you get to play in such beautiful places."